Model No: X3850 X5. Storage: None (8x 2.5" SAS Hard Drive Bays). 1 x IBM QLogic QLE2462 39R6593 39R6528 4Gb FC Dual-Port PCIe Host Bus Adapter. 4 x SIX-CORE XEON E7450 2.4GHz Processors. 3 x 73GB 10k SAS Hard Drives. 1 x 73GB 15k SAS Hard Drive. 64GB RAM (8 x 8GB). IBM x3850 Rack Mount Enterprise Server. 6 x 73.4Gb 10k SAS Hard Drives. DVD/CD-RW Combo Optical Drive. All other standard features. 2 x Power Supplies. 4 x SIX-CORE XEON E7450 2.4GHz Processors. 2 x 72GB 10k SAS Hard Drive. 1 x 73GB 10k SAS Hard Drive. 1 x 73GB 15k SAS Hard Drives. 64GB RAM (8 x 8GB). 4 x SIX-CORE XEON E7450 2.4GHz Processors. 1 x 72GB 10k SAS Hard Drive. 64GB RAM (8 x 8GB). 1 x 73.4GB 10k SAS Hard Drive. 4 x SIX-CORE XEON E7450 2.4GHz Processors. DVD Drive. In good condition and full working order. 4 x SIX-CORE XEON E7450 2.4GHz Processors. 2 x 72Gb 10k SAS Hard Drives. 2 x 73Gb 15k SAS Hard Drives. 64GB RAM (8 x 8GB). This is like a new installation. DVD/CD Drive. IBM X3850 X5 4U CTO CHASSIS. We Accept Only. Ending Soon. New Arrivals. QUICK LINKS. we do not take any responsibilty after this. Why Choose Us! Audio Visual. 4x 1400W Platinum power supplies. 512GB RAM 32x 16GB Modules. Model x3850 X6. RAM expandable up to 6TB of RAM per server (96x DIMM sockets, 24x DIMMs per CPU). 4x Compute Books each with the following. 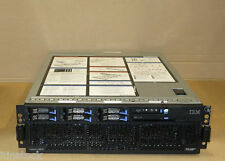 IBM X3850 X5 CTO CHASSIS 8 SFF DVD. We Accept Only. Ending Soon. New Arrivals. QUICK LINKS. we do not take any responsibilty after this. Why Choose Us! Audio Visual. RAM: 16GB high-speed PC2-3200 ECC DDR2 SDRAM. Server Specs. PCI Slots: Four 64-bit Active PCI-E x8 and two 64-bit Active PCI-X 2.0 266 MHz slots. This item is covered with 1 month warranty. In any case, make sure you do not remove the warranty sticker from the item. 2048GB (2TB) RAM 64x 32GB Modules. 4x 1400W Platinum power supplies. Model x3850 X6. RAM expandable up to 6TB of RAM per server (96x DIMM sockets, 24x DIMMs per CPU). 4x Compute Books each with the following. The IBM x3850 server contains advanced third-generation Enterprise X-Architecture™ (EXA) technologies that combine four-socket SMP power, Active PCI-X 2.0 and PCI-E x8 expansion, high availability, and substantial internal data storage capacity. For sale is an IBM X3850 X5. 512GB 8500R 16GB Ram. 2 x 146GB HDD. 4 x E7-8837 Eight Core processors running at 2.66GHZ. All hard drives are fully tested by performing a HMG Infosec Level 5 wipe on them. This is for both our protection and yours. IBM QPI WRAP CARD FOR X3850 X3950 X5 - 59Y4810 - 46M0000. What Makes Us Different?. 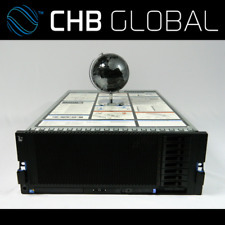 TheIBM 3837-AC1 is anIBM x3850 X6 server. It provides several high-availability features in a high-density, 4U rack-optimized design. Processor Type Xeon. Processor Manufacturer IBM. Type Server. Processor Speed 2.3 GHz. Monitor & TV. we do not take any responsibilty after this. you can buy in set of 6 max. PC Components. Ending Soon. Why Choose Us! Monitor & TV. we do not take any responsibilty after this. PC Components. Ending Soon. Why Choose Us! Audio Visual. X3850 X5 System X Server built to the following spec Matrox SVGA (16 MB) video. 10 Gigabit Dual-Port Emulex Ethernet Adapter. Product is cleaned and tested, sold as refurbished. IBM fan cage / cage fan for X 3850, X 7141 Server - 44E4576. Model IBM fan cage / cage fan for X 3850, X 7141 Server - 44E4576. Part Number 44E4576. MPN 44E4576. Fan cage / cage fan for IBM X 3850, X 7141 server. X3850 X5 System X Server built to the following spec 4x4GB PC3-10600 DDR3 DIMM. Matrox SVGA (16 MB) video. 2.13 GHz (24 MB L3 cache). 10 Gigabit Dual-Port Emulex Ethernet Adapter. Modell System x3850 X6. Speicherkapazität (RAM) 256GB. Prozessortyp Xeon E7-8880 v2. RAM 256 GB DDR3. Cores 15 core, 30 threads. HARD DRIVES 3 x 1.2 TB of 10 k SAS 6 G 00AJ147. The units were subjected to extensive testing in our technical system integration and have passed this course correctly. Part Number 43W8673. Power backplane for x 3850 M2 and x 3950 M2 Server. Power backplane. System x 3850 M2, System x 3950 M2. Manufacturer IBM. Server & Netzwerktechnik. GENERAL INFORMATION. second system - your 1st choice for 2nd generation hardware. Part Number 43V5372 / 44W2728. 4-port SAS HDD backplane for IBM X 3850 and X 3950 Server. 4-port SAS HDD backplane. IBM X 3850 / X 3950 Server. Manufacturer IBM. Server & Netzwerktechnik. second system - your 1st choice for 2nd generation hardware.